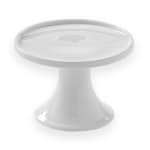 The American Metalcraft PSP4 round serving stand is great for merchandising muffins, cupcakes, and more. Its 4-inch height provides a perfect presentation height for baked goods on buffets, tables, or counters. Its porcelain construction can stand up to heavy use. Since the American Metalcraft PSP4 round serving stand comes in white, it fits in with virtually any establishment’s theme.